Bangkok, Thailand, Feb. 4, 2017. 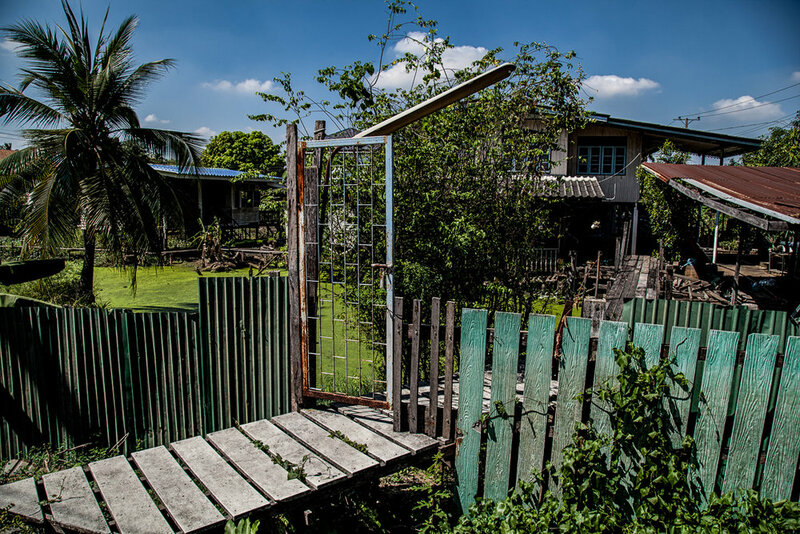 A view of one of the houses in the neighborhood of Bangkok where the Montagnards live. Thailand, Bangkok - Far away from the sprawling skyscrapers at the heart of Bangkok's megalopolis lives a small community of 150 Montagnard families. This is the story of some of the Montagnards who escaped Vietnam as early as January this year and are now living without papers in Bangkok, Thailand. They cannot move or work freely, they have very limited resources to pay for food and rent and they must constantly be on alert as Thai police arrests refugees and puts them in detention centers where they can be held for a very long time if no one comes to pay for their release. After escaping Vietnam, they now have to face another form of persecution that can take much longer to escape: statelessness. Rmah Aloh, 27, Bangkok, Thailand Feb. 4, 2017. After escaping Vietnam for the first time in February 14, 2014, the Vietnamese police got hold of his phone number, traced him back in Bangkok and sent a police squad to get him back to his village. En route to Laos, he was taken inside a house, beaten and made to sign a confession saying he left for economical reasons and not because of persecution. "Don't believe the communist government," he says. "They tricked me once, they will trick me again." This is his second time escaping to Bangkok. As retribution for his act, his wife was raped by local police. Nay Bro, 62, Bangkok, Thailand, Feb. 4, 2017. One of the organizers of the 2001 protest that shook the Central Highlands, he now lives in Bangkok as a refugee with no papers. Jailed and beaten for 7 years for organizing a demonstration that demanded human rights, freedom of religion and an end to land grabbing policies. "I will never, ever go back," he says. "My son is still in jail. It's been 12 years now; I don't know what happened to him." David Cil, 27, Bangkok, Thailand, Feb. 5, 2017. David lost his appeal with the UNHCR as they claim there was not enough proof to backup his story. He now lives in Bangkok as refugee with no papers. His two older uncles escaped Vietnam because of religious persecution and were able to be resettled in Quebec, Canada. David Cil, Bangkok, Thailand, Feb. 5, 2017. David show his UNHCR card as proof that he was interviewed - he wants his case to be reopened and his waiting for another appeal with the UNHCR. Hin Rmah, 36 with her daughter, Bangkok, Thailand, Feb.4, 2017. Her husband left Vietnam on Dec. 14, 2013 after the government took their land, leaving them unable to work. She was repeatedly questioned, jailed and beaten as retribution for her husband leaving. She escaped Vietnam thanks to the help of a couple she met at a hospital and they drove to the border where she was able to cross Cambodia and then Bangkok. 3 of her children are still in Vietnam. Bangkok, Thailand, Feb.4, 2017. A view nearby the compound where the Montagnards live. The exact location is undisclosed for fear of retribution by the Vietnamese authorities and arrest by the Thai police. Pastor Pornchai Kamonsin, a Thai pastor from Bangkok's Glory to God Church who helps the Montagnard community in Bangkok. Ayun Tre, 50, Bangkok, Thailand, Feb. 4, 2017. "The Vietnamese police used a glass bottle and hit me so hard that they broke my tooth and cut my eye," says Tre, 50, now living stateless in Bangkok. In 2003, the Vietnamese police called him to renounce his faith and and made him work 15 days non stop as punishment. He was beaten and arrested once more in 2014 and decided to leave by himself. The police arrested and beat his wife to make him come back. His interview with the UNHCR is scheduled for 2019. Ro.o Y Brik, 72, Bangkok, Thailand, Feb. 4, 2017. Brik, a soldier with the South Vietnamese Army, fought with the French during the Indochina War and with the Americans during the VIetnam War. He was beaten and persecuted as early as 2007 because of his religion. "They accused me of trying to overthrow the government and asked me if I belonged to FULRO," he says. "But I don't know much about it, I don't follow anyone but God." He escaped Vietnam in 2015 and the police then arrested and beat his wife, leaving her with severe nerve damage. His land was flattened in 2016. He sold everything he had and borrowed money to bring his wife and children to Thailand where they now wait in limbo. Nay Hoch, 45, Bangkok, Thailand Feb.4, 2017. Arrested and beaten for practicing his religion, he was sentenced to five months in jail and forced labor - he was made to dig a sewer and drains buried deep underground - and beaten repeatedly. Hoch was also arrested in Thailand for working illegally on a construction site (Thailand is not a signatory to the UN's 1951 Convention Relating to the Status of Refugees or its 1967 Protocol Relating to the Status of Refugees) and does not allow refugees to work. Bangkok, Thailand, Feb.5, 2017. Lô Mô y Hoa, a Montagnard who claims he was shot by the Vietnamese police. He now lives stateless in Bangkok. Bangkok, Thailand, Feb.4, 2017. Inside the compound where the Montagnards live, children are playing with one another.